This boiler is a highly efficient wall mounted gas boiler. With it being a system boiler it directly heats your central heating system and hot water for a storage cylinder. Most of the important parts of the hot water and heating system such as the pump and expansion vessel are built-in on a system boiler, making it quicker and cleaner to install. It also means you don't need to have a feed and expansion tank in the loft. This highly dependable unit is made and manufactured by Potterton. It is an efficient unit and it comes with an efficiency rating of 89% and an output rating of 12kW making it perfect for those smaller properties that do not have a high demand for hot water. This boiler is also available as a 12kW, 15kW, 18kW, 24kW and 28kW boiler. So you can be sure there is an unit in this range to suit you and your homes needs. This boiler has an industry leading choice of flue lengths, meaning it can be placed just about anywhere. This boiler comes with a variety of different features and benefits, with its pipe work being able to pre installed using the pre plumbing jig to provide flexibility. This boiler is a compact boiler helping it to fit in the smallest of places and save you room in your home. It is also a lightweight unit helping to save you time and money on installation, as well as it being an easy to maintain and repair in the unlikely event it goes wrong - this is done through its front access. 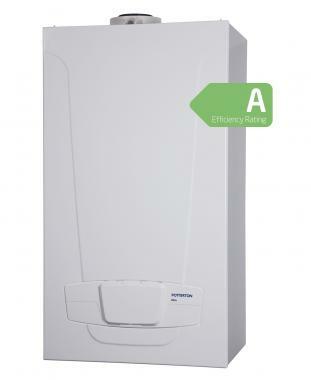 This boiler is compatible with multifit gassaver so you can save up to 37% on your gas bills. It is also compatible with the megaflo eco solar cylinder helping to provide an even more efficient unit that it already is. With this unit also comes an option of flueing up to 20m long helping for the flexibility in where it can be placed. It also has an NOx 5 which is the best class making it an extremely quiet boiler in operation. This boiler also comes with a robust hydraulic connection so you can be sure that you are getting an reliable and high quality boiler. Another way you can be sure is with its 2 years warranty to give you peace of mind that it won't let you down.